Learn what it takes to implement a strategy that will work! Explore how teams approach product development. 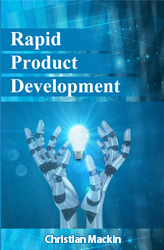 Discover how different tools for successful Rapid Product Development are used. Learn how Fortune 1,000 Companies outsource design engineering. See how letting go of the details lets you hold on to the big picture. Discover how an India Design Center can accelerate product development. Learn to accelerate development and usher in the Growth Phase. Explore cost saving systems for sustaining engineering. Discover where investment pays off and loss begins. Learn how Fortune 1,000 Companies staff Onshore and Offshore engineering departments. See how One-Way Video Interviews are changing recruiting today. Discover how remote virtual staffing can bring top talent to your business.